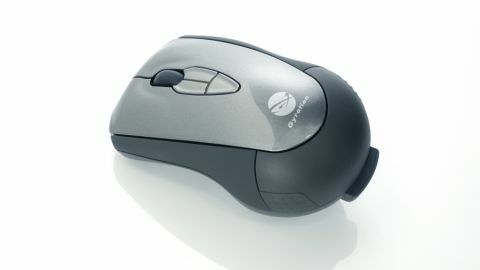 The Gyration Air Mouse Mobile can be used as an ordinary, everyday desktop mouse, but it's when you pick it up that it really comes into its own. It contains powerful motion sensors that can track its movement in your hand. While holding the trigger on the underside of the mouse, your arm and wrist movements control the on-screen cursor. Releasing the trigger disengages the sensors so you don't move the pointer unless you want to. This motion-sensing technology was originally based on that used in Nintendo's Wii controllers, though it's evolved considerably since. Although the form factor is the same as before, a few changes have been made under the hood. On the desktop, it now uses laser instead of optical technology. Its wireless connectivity has been beefed up, and its MotionTools driver software is now available for the Mac. The price has been cut too, down to £59 from £79. With MotionTools, you can assign functions to its three programmable buttons, and also set up application-specific gestures activated by holding a button and swiping the mouse through the air. You can even summon OS X's built-in Keyboard Viewer for typing login details or passwords. Sadly, you can't set the mouse's in-air and on-desk sensitivity independently, so your chosen settings might prove a compromise. It's easy to dismiss a device like the Air Mouse as a mere gimmick, but with practice it can prove very handy for presentations, media Macs or in situations where you don't have a flat surface for your mouse.